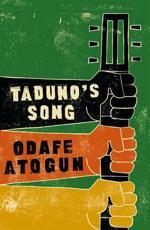 Odafe Atogun presents Taduno’s Song, his Kafkaesque Nigerian tale. Odafe Atogun was born in Nigeria, in the town of Lokoja, where the rivers Niger and Benue meet. He studied Journalism at the Times Journalism Institute, Lagos and is now a full-time writer. He is married and lives in Abuja. Taduno’s Song follows African singer Taduno, who returns from political exile to the country of his birth to find that the dictatorship's efforts to erase all trace of him have been so successful that he has been entirely forgotten, even by his closest friends and neighbours. But one man remembers: the country's dictator. And upon his return home Taduno discovers its leader has imprisoned the woman he loves and will murder her unless he performs in support of the regime. Taduno must make an impossible choice: fight the power or save the woman he loves. Taduno's Song sees Atogun tackle major universal themes of resistance in the face of a dictatorship's oppression and in the background of this novel lie hints at the incredible life of Fela Kuti, human rights activist and Nigeria's greatest singing superstar, who regularly clashed with the authoritarian Nigerian regimes of the 1970s and 1980s. This is a story of sacrifice, love and redemption, from an utterly fresh new literary voice.